This is a skein of novelty yarn in progress. The completed yarn is below. 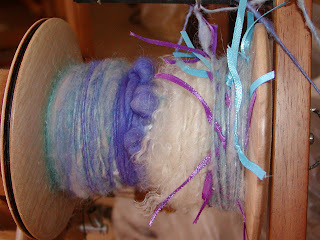 The above yarn is spun at sport weight or thinner with beads, ribbon, novelty bits and pieces added to thick and thin, knots, buds, etc. Took forever to spin all 305 yards. You could do an entire freeform piece without ever cutting the yarn and weaving pieces in. You can call to buy it (520)572-3758, or email me at jmarckathy@aol.com. 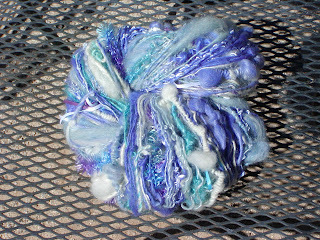 This is a bulkier skein of yarn with lots of coils, fuzzy mohair, beads, ribbons and novelty bits thrown in. It has the same color skein as the one above. It has 155 yards. 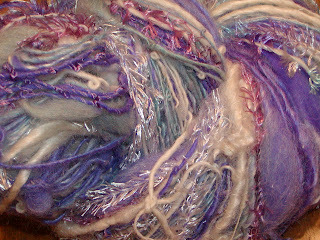 The fiber used to create the above two skeins is Shetland/Border Leicester lamb, kid mohair and wool.